Scratchy, the cat I live with, has been up to all kinds of mischief lately. For some reason I always get all the blame for all the mischief around here, but this time I have proof that Scratchy did it. 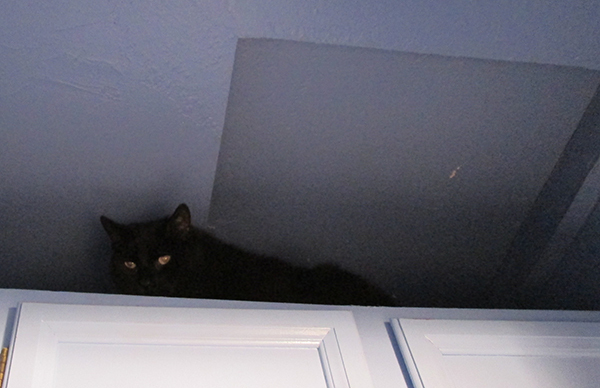 Scratchy’s on top of the laundry room cabinets. And it’s sure a good thing that opening to the attic is closed up tight. 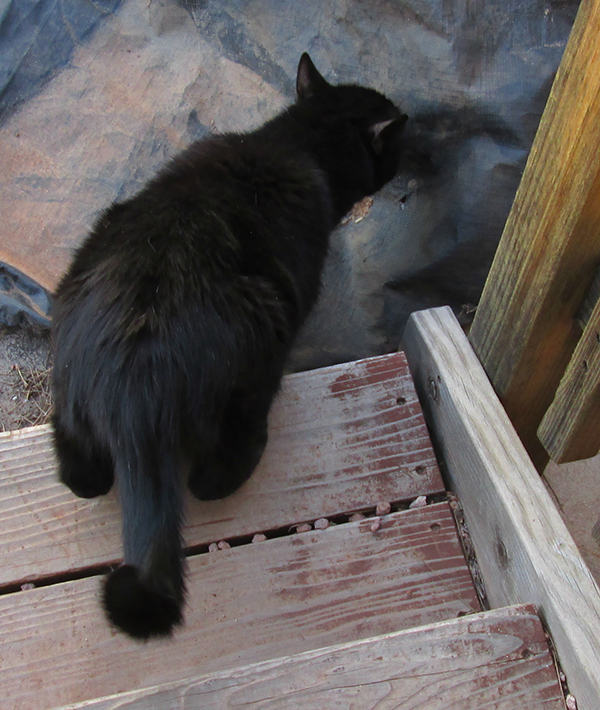 Because my person said when it was first put there – way back before I lived here – the cover wasn’t over the hole and Scratchy discovered it before she did. But since Scratchy couldn’t escape that way he tried another way. And don’t think Scratchy was just sniffing the air because he didn’t stay at the entrance. Who knows where Scratchy would have ended up if I hadn’t put a stop to it. If Scratchy doesn’t stay where he belongs I’m going to have to do something about it. Like lock him up in cat jail. I’m the only one around here who’s allowed to be an escape artist. Scratchy seems to be living up to her name in the last photo! What an uncooperative prisoner! LOL! M.K., there was a reason Scratchy got his name. Patrecia, it was Scratchy. I swear! Patrecia, you must have been talking to my person. She doesn’t believe me either. I dont know bongo, competing with cats to be #1escape artist could be quite a challenge. Maybe you 2 should join forces. FireBonnet, I think Scratchy would put a damper on my adventures. I don’t want either one of you disappearing! Be careful. Watch out for each other. Cupcake, is it okay if I disappear and end up at your house? I’ll come back home eventually. What a clash of the titans you two are in that last photO! Will and Eko, I think I should change Scratchy’s name. Then maybe he wouldn’t be so handy with his claws. Scratchy looks a bit grumpy. Patricia, I think Grumpy is Scratchy’s middle name. Every time I look at him he’s grumpy. Scratchy needs to stay in the house! There doesn’t need to be a lost kitty! Good job Bongo for keeping an eye on him. Thanks Marty. 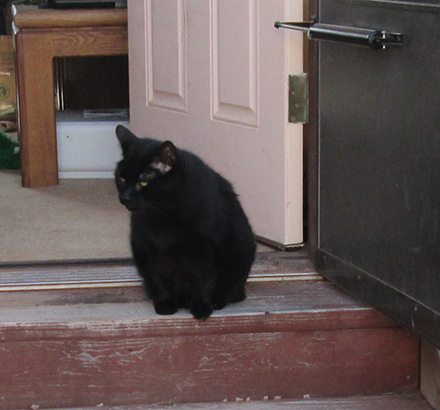 If Scratchy escaped I’d have to give all the coyotes what for so they wouldn’t come after him. Coyotes are very scary. They love little animals. Marty, that’s why my person makes Scratchy stay in the house. Lily and Edward, Scratchy is always up to no good. He needs to be locked up for a long time. Thanks Snoopy. I do my best to keep Scratchy in line. Phew! I’m glad that Scratchy was not a escape artist! Oh no! Bongo…you shouldn’t be a escape artist either….I don’t want to miss your adventures!!!! Kevin, I have some of my best adventures when I escape. I always come home eventually. But my person has caught on to all my tricks and I haven’t been able to escape in a long time. Good for you Bongo! 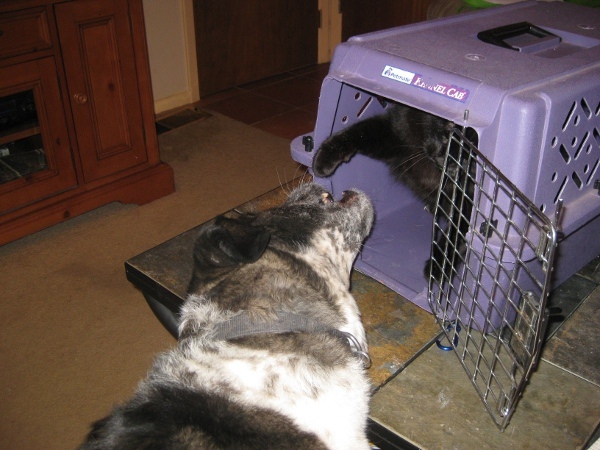 I think you saved the day because Scratchy would have really gotten into trouble if you didn’t lock him up. Every now & then Moe escapes & I have to round him up – sometimes it takes a couple laps around the house, but I get him back where he belongs & Diane gives me cookies. Dig you get cookies for your good deed? Lola, come to think of it I didn’t get any cookies for that. I’d better go collect.